The Jääkäri XL (a.k.a. 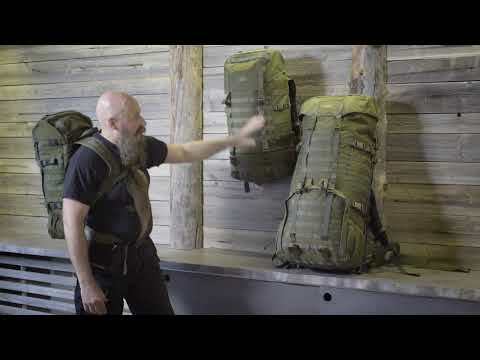 Jääkäri-rucksack) is an improved model of the modular LJK paratrooper rucksack originally designed for the Finnish Defence Forces. Genuine user experiences have already been taken into account in the design of the rucksack and the best of the many ideas have been sewn together to make the Jääkäri XL. Based on the feedback received, we have further developed the versatility, durability and look of the rucksack. This XL size carrying device of the Jääkäri family is much more than just an ordinary rucksack. The carefully thought-out details and extensive MOLLE webbing make this rucksack a truly modular and versatile tool that adapts to the needs of the user. Due to the slim shape, the rucksack is ideal for those who are skiing or hiking in difficult and demanding terrain. Thanks to its strong, manually welded aluminium frame and revised supportive carrying system, the Jääkäri XL is very sturdy to carry. The support frame holds the Jääkäri XL firmly in shape and distributes the burden anatomically to your hips so that your back and shoulders are not overstrained even with the largest of loads. The detachable hip belt of the rucksack can also be used as a separate combat, equipment or sledge belt, when needed. With the rolltop and compression straps of the bag, the Jääkäri XL can be tightened so that it sits firmly and does not jiggle around even when not full. This improves carrying comfort. In addition to the excellent carrying features, this “military spec” rucksack is made of durable and high quality materials. The rucksack was field-tested to the extreme. We dropped it from 350 metres to test its strength and filled it with gravel for the carrying test, and the rucksack passed both tests with flying colours. We offer the Jääkäri XL a 10-year guarantee. The actual bag of the Jääkäri XL (height 84 [max. with rolltop 112 cm] x 32 x 23 cm) has been designed to be slim but still spacious enough to hold the necessary supplies even for a longer hike. The opening of the bag is closed with the dry bag-style rolltop. Rolltop is easy to use even when wearing mittens and the design is practically waterproofed. When open, the rolltop makes packing easy. Once the bag is packed, it rolls easily and fits tight and snugly to the size of the content. With rolltop, the size of the rucksack can be anything between 80 and 100 litres, and the package is always firm! The opening is covered with a flap which hugs the top of the backpack and is secured with straps. The flap has been attached with adjustable straps from both sides. This “floating” flap enables easy overpacking and the protection of the overpacked load. If necessary, the generous length of the straps provides a lot of space under the flap for extra supplies, such as a sleeping bag. Furthermore, there is a spacious zippered pocket (5 litres, 33 x 31 cm) for valuables inside the flap. The bag contains a divider with which it can be divided into top and bottom sections. In the top section inside the bag, there is a pocket (35 x 30 cm) for a hydration bladder or supplies to be kept separately. This pocket will easily hold a contemporary 13.3-inch laptop or any smaller pads. In the middle at the lower section of the rolltop there is a protected exit for a hydration bladder hose, cable or antenna. The contents of the bottom part of the bag can be accessed quickly through a zippered flap (flap dimensions 34 x 34 cm). The zipper has two pullers so the flap can be opened from your preferred spot. The back of the bottom part of the bag has adjustable elastic bands (2 pcs) with quick-release fasteners for tying gear. Additionally, the bottom part flap has four mesh pockets (13 x 13 cm) for storing loose objects and valuables. With the four compression straps on the sides of the rucksack, the bag can be tightened compactly even if it is not full. The compression straps have been equipped with quick-release fasteners and they can be detached as well as freely adjusted with shortener buckles. The manually welded DUR aluminium support frame is attached to the supportive carrying system with MOLLE loops. This means that the carrying device can be adjusted to accept, for example, a weapon bag between the frame backpack and the frame. Low on the sides there are open pockets with elasticised openings where you can place small supplies or, alternatively, a long tool or a water bottle, the neck of which can be tied firmly in place with a side compression strap. The bottoms of these pockets also have metal rings to remove water from the pocket. Jääkäri would not be Jääkäri without the modular structure provided by PALS webbing, familiarly known as “MOLLE”. By applying this technology, the Jääkäri XL has been made into a cutting edge modular package. MOLLE webbing can be found on the front, sides, flap and even the bottom of the Jääkäri XL. With MOLLE, you can attach any pocket compatible with PALS almost anywhere you want on the Jääkäri XL. By means of suitable pockets, the Jääkäri XL can be freely expanded into a multifunctional carrying device with adequate characteristics to meet even the needs of demanding professionals. In addition to its modular attachment possibilities, the MOLLE webbing reinforces and stabilises the rucksack. One MOLLE loop on the Jääkäri XL can bear over 100 kg of weight. Long attachment straps run over the upper flap and down halfway the front of the rucksack. Comparably, straps attached to the frame run upwards from the bottom of the rucksack. If necessary, a 25 mm strap dives nicely along the MOLLE webbing and can be lifted to the surface wherever desired. This enables the tying of supplies securely on the front of the rucksack without additional detachable straps. The bottom of the backpack has two rows of MOLLE through which the straps can be run. This means that equipment can be tied to the bottom of the backpack as well. Tying to the bottom is an excellent carrying method for rolled sleeping mats, for example. There are attachment points also on the hip belt of the rucksack. In the middle of the Jääkäri XL’s front side and at the bottom of the bag there are attachment loops (2+2 pcs) for the transport of loose equipment, e.g. a camping axe. It is also possible to fasten items that would not otherwise fit in the backpack behind the side compression straps of the bag. The compression straps have been sized to be long enough to extend over the backpack all the way to the opposite attachment point, if necessary. The Jääkäri XL features a new carrying system. The detachable hip belt is attached to the bag with MOLLE webbing. The hip belt fits perfectly in place, ensuring comfort by distributing the load correctly on the pelvic bones. Further comfort is provided by the padding pillow setting against the small of your back. The hip belt is fastened with a sturdy quick buckle. The inward-tightening buckle is easy to open, but will not open by accident. The hip belt also features tightening for the bottom section of the bag, with which the bottom section of the rucksack can be tightened into a snug package. The belt can be detached from the supportive carrying system with little effort, and it can be used as a separate combat, equipment or sledge belt. The two-row MOLLE webbing on the belt allows the user to add pockets. The DUR aluminium pipe frame base of the Jääkäri XL’s carrying system is light and durable. The wide straps of the rucksack have been designed with ergonomics and comfort in mind, and stitching has replaced rivets to ensure better durability. On the front of the straps there is a chest strap that distributes the load and keeps the rucksack on the shoulders as designed. The chest strap is adjustable in length and height. The shoulder straps also include attachment loops for small items. The shoulder straps are adjusted with ladder buckles made of Delrin special plastic blend. The buckles withstand extreme conditions, shocks and even the freezing cold. The shoulder straps also have a separate adjustment for the distance of the rucksack’s frame. This adjustment is used according to the terrain and/or when you want to transfer more of the burden to the hips and rest your shoulders. The height and tightness of the supportive carrying system and hip belt can be adjusted continuously, so the rucksack is fully adjustable according to the anatomy and proportions of the user. Furthermore, the supportive carrying system allows the adjustment of shoulder strap width to accommodate the rucksack for all shoulders, both wide and narrow. The rucksack does not have an upper curve, allowing travelling with the rucksack even in cramped spaces. The top of the rucksack has a carrying handle attached to the frame with which the rucksack can be moved easily when it is not on your back. The largest member of our family of general-purpose pockets is called the Savotta Mpp pocket L.
The smaller member of our all-new horizontal pocket product family is called the Savotta Horizontal pocket S.
Vertical pocket L is an excellent general-purpose pouch for backpacks with PALS/MOLLE webbing. The medium size member of our all-new vertical pocket product family is called the Savotta Vertical pocket M.